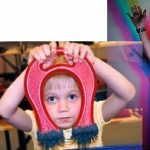 The BIG Little Science Centre (BLSC) was started in February 2000 by Gordon R. Gore, a retired science teacher who has dedicated his life to teaching science in an interactive environment. The Centre currently operates out of four classrooms and gym leased from School District 73 at Happyvale School. The current program format allows visitors a period of time to experiment on their own at any of 140 plus hands-on stations located in the gym. The four other rooms are used for demonstrations and as basic teaching laboratories.